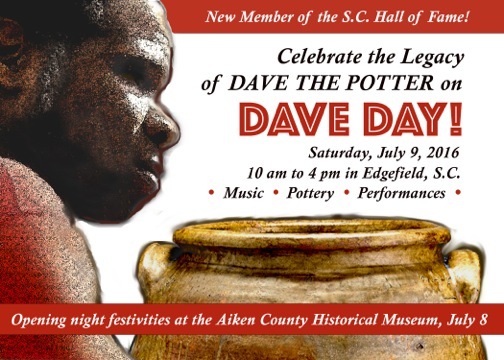 Come celebrate DAVE THE POTTER at a two-day, two-town festival in honor of this extraordinary African-American artisan! Dave, born into slavery, lived for the first three-quarters of the 19th century in the Edgefield District of South Carolina. Thirsty for knowledge, he dared to challenge anti-slave-literacy laws by learning to read and write. He left an indelible record of his life and times in a series of original poems inscribed on his pots. The American Scholar describes him as a man who has “assumed heroic proportions in South Carolina.” This is the moment to celebrate him, for David Drake, as he was known after Freedom came, has just been inducted into the South Carolina Hall of Fame! The celebration begins in Aiken on Friday afternoon, July 8 at the Aiken County Historical Museum, 433 Newberry St. SW. At 4:00 pm, author Lucinda Clark will offer a program of local children reading poems inspired by Dave’s writings. Experts on Southern Folk Pottery will exhibit examples from their collections. At 6:00 pm, filmmaker George Wingard will present the prize-winning documentary film “Discovering Dave” and answer audience questions. Refreshments will be served. On Saturday, July 9, the celebration moves to Edgefield’s historic Courthouse Square. Festivities will begin at 10:00 am with live bluegrass music. Area artisans will exhibit their work. Master potter Justin Guy will recount the story of Edgefield Pottery in his newly opened studio, The Phoenix Factory. In one of the morning’s highlights, a choir and dancers from the Second Providence Baptist Church in North Augusta will perform an original work inspired by Dave’s life. Throughout the day, the Tompkins Library and Welcome Center will feature displays of books and films about David Drake. Also on display will be Dave pots from the collection of the late Raymond Timmerman. The Corner Market will sell its famous barbeque on the square from noon till 1:30 pm. Carolina Moon Distilleries will offer liquid refreshments. Other downtown restaurants will be open for lunch—Chef Bob’s Café, Delectable Delights, The Pool Room, The Dog House, and the Old Edgefield Grill. At 2:00 pm, the focus shifts to Edgefield’s large, new potting facility, The Clay Studio. There, a two-hour program will celebrate Dave’s achievements. The Georgia Ring Shouters and the Edgefield County Mass Choir will sing. Among the speakers will be Dave biographer Leonard Todd, historian Wayne O’Bryant, and esteemed pottery collector Dr. Arthur Goldberg. Near the end of the program, genealogist April Hynes will reveal a long-missing piece of Dave’s story! Come one, come all to this exciting celebration! All Dave Day events are free and open to the public. For more details, contact Tonya Guy (Edgefield) at 803.637.4010 or Brenda Baratto (Aiken) at 803.642.2015.